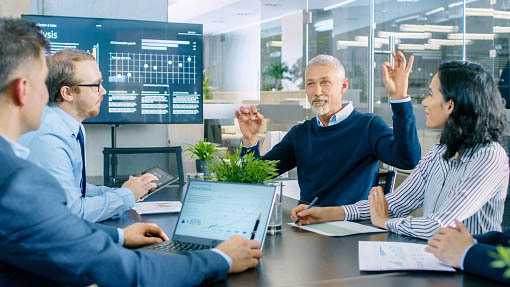 As younger generations advance in their careers and start to take on more prominent roles within their companies, it’s very likely many will find themselves in a position where they may have direct reports who are older, and in many ways, more experienced. It can be a tricky position for a young leader, so it’s vitally important to get off on the right foot when taking on a new leadership role. Here are a few things for young leaders to keep in mind when leading older employees. Confidence can be your most powerful tool. A team will rally behind leaders who show they believe in their abilities and have a clear vision of how and where they want to lead. However, there’s a fine line between confidence and arrogance. Acting like you’re above those you lead only breeds contempt. Actions speak louder than words, so be prepared to show every employee that you not only believe in yourself and have the skills to lead, but that you are also willing to walk the walk. Even though a young leader may have truly earned a position of leadership over older co-workers, it doesn’t mean they automatically know everything. It’s important to always give credit where credit is due. Older employees often have the benefit of years of experience behind them, so young leaders should be willing to tap into that knowledge. Ask for input and opinions. Validate their experience and learn from those workers who have been around and have valuable insight to offer. Every generation has its own opinions about those that came before and those that follow. The values, beliefs, and work ethics of one generation may not have any bearing on another, so it’s important to understand the different generations in the workplace and what motivates each one. Great leaders understand that what drives a Baby Boomer to achieve is likely going to be completely different than what a Millennial needs to perform at their best. There’s a delicate balance between the generations, but with a little understanding, it will be much easier to bridge any gaps. We all get set in our ways. It’s just human nature. So, when a young leader comes rushing into a team at full throttle and starts making major changes on day one, they’re likely to step on a few toes. In many cases, processes or strategies that may seem out of date or inefficient on the surface are in place for a good reason. Taking time, in the beginning, to understand team dynamics and getting to know each employee’s strengths, weaknesses, motivations, and visions for success will pay off in the long run when you initiate major changes. Think of yourself as a leader, not a manager. In the end, it’s often a matter of perception. Rather than acting as a manager, your team feels like they have to “report” to, try to be seen as a leader they want to rally behind. No matter their age, if you can earn an employee’s respect, the most difficult part of leading them is over. Once you’ve shown you are confident and competent, getting a team to work with and follow you comes naturally. Do you lead employees who are older than you? Describe your experiences or best practices in the comments section below. The Results Are In: What Type of On-the-Job Training Does Your Company Provide? Not all baby boomers find technology a challenge! I’ve been the tech person in most departments that I’ve worked in! I really resent it when Millennials come in with the attitude that they know more than I do about tech. I have a new group of co-workers, all a couple of decades younger than me, and they came in with the attitude that they were here to ‘fix’ me. Most of their ideas are things I am already doing to make changes! The whole stereotyping people because of the year they were born doesn’t sit well with me! So many of the stereotypes are wrong, at least about me and others I have worked with that are my age. Hi Kathleen, You’re absolutely right. It’s a tired stereotype that, honestly, makes less sense the more technology has become integrated into ALL our lives. I’m going to rethink and rephrase the point I was trying to make in that section. Thanks for the great comment! Regardless of the age, I found out that people are afraid of trying new things such as technology. When they are in their comfortable zone they hesitate to change and think that they are right all the time! As an organization and you are be a part of leader or even a staff you need to influence people to change for the best of the organization that they are working for. If a person have a positive attitude this person can change or do anything for his/her organization. If you don’t change to adapt with the working environment you will be gone in no time. When working with older people you need to lead them in way that you make them understand the need of change. They will gradually buy-in your action. It takes time and patience!